Heels are one such important thing which needs to be updated from time to time in every girl’s wardrobe. Heels enhance your looks and add on to your personality. This is the reason why every girl is conscious about her heels. If you are also one among them, you definitely need to know types of heels in fashion currently. If we talk about the season heels, gladiators are the type of heels which are most loved by the ladies. First of all you need to understand what are actually the gladiator heels? These are no different from the usual gladiator sandals that girls wear around. The only basic difference is that they are attached with a heel or wedges. They are known for their thick straps which almost cover your foot in this sunny weather. One could see their favorite celebrities wearing these types of heels in fashion shows or on ramps or while making media appearances or even on red carpet. These heels not just provide style but also give you a high level of comfort. So spending your bucks on these gladiator heels is absolutely worth it. Other types of heels in fashion are the colourful wedges. These heels are best known for their full support to the foot. These heels come with a thick sole which balance your foot equally and helps you walk perfectly. Because these heels are not pointed or come with a thin sole, they also helps in reducing the problem of ankle pain or foot pain which are generally caused by other types of heels. These are evergreen heels and are always loved by college going girls as they go perfectly with your jeans and top. 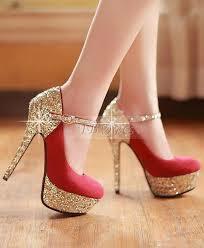 Another type of heels which is in trend is undoubtedly the stilettos heels. These are the best of all heels loved by all the girls. They go for every occasion, whether its a party, a Sunday day out, a get together or an office meeting. They start from a heel height of 2 inches and reach up to 8 inches. These heels are very thin and pointed towards the end. These are very much in fashion. They come in very funky colours and are loved by girls for almost every of their occasion especially for disc parties and pubs. It is often said, a girl is not ready for a party until she wears them up. These heels are the best one to flaunt and make those girls jealous who aren’t wearing them because these are one of the types of heels in fashion. These heels are easily available on the stores with a huge variety. So girls what are you waiting for? Even after knowing what is in the trend will you be sitting at home to let the trend get pass or will you be flaunting them this season. So get your fashion inspiration going, and spend a few bucks on these heels and then the world is all yours, get ready to rule it.